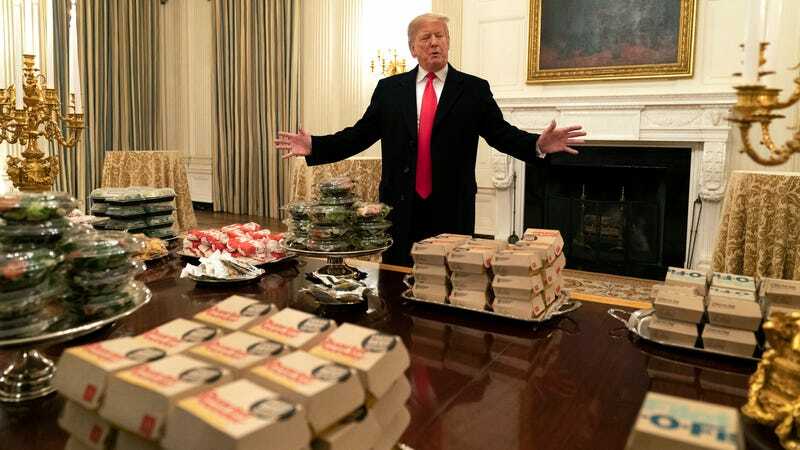 In a rare instance of Donald Trump saying he was going to do something and then actually doing it, the current president followed up on his promise to serve fast food to the national college football championship team from Clemson on its visit to the White House last night. Maybe this dinner qualifies as an official state function. Or maybe the president is just cheap as hell. Event photos featured platters of everything from burgers to salads to a variety of sauces strategically placed on elegant White House tables, accented by formal candlesticks. But you have to wonder how appetizing that fast food was after sitting around for a while before the event started. Cold fries are the worst. The specific amount of food varies from various reports: Trump started out crowing about 300 burgers, then upped the number 1,000 “hamberders” in a since-corrected tweet this morning.